Duran Duran news – Chain D.L.K. 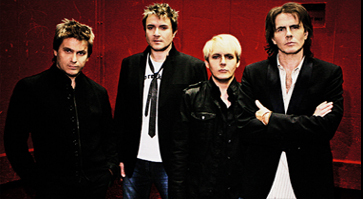 There have been some new changes to http://www.duranduran.com, and we hope you’re enjoying the site’s new design! We’ve been getting some cool new shots to put in the DD.com Gallery. Take a look here : Gallery. John has a new experiment- submitting one photo a day for thirty days. Check out his “project” here: JT’s 30 in 30. It’s been a busy birthday month for Roger, between upcoming DJ dates, spinning at the Fate Awards in Ireland and leaving a birthday message for the readers of the site here: Roger’s Birthday Message. The new Bowie Tribute album is on its way, with DD covering “Boys Keep Swinging“. Check out the cool cover art for this great charity compilation record here:Bowie tribute Cover. John had a fantastic time putting together a benefit show recently for the New Roads School in California. You can get a CD of the event and read more about the school here: New Roads School Benefit CD. Nick & Simon joined Mark Ronson for a performance at Ronnie Scott’s last month. Get the scoop here: Nick, Simon & Mark. Have you been to the fan community lately? This month there is a great new Kafe from Roger, exclusive photos and videos, and some amazing contests including sending 2 DDM members to see Roger DJ a date in the UK in VIP style! If you want to get the early lead on any show announcements, enter fun contests, win cool prizes and get access to member-only content visit the official fan community atDuran Duran Fan Community.